Matt, I think this is mostly wonderful. Great, even. But in the grid at the bottom of the post, I’m wondering why Stations of the Cross is plugged in the Good Friday slot when there is an actual proper liturgy for the day that is probably older than anything else in the Triduum? Stations is a very nice supplement, but the real thing is the dramatic reading of the Passion, the Solemn Collects, the Veneration of the Cross, and Holy Communion from the previous evening’s leftovers. You are surely correct on my Good Friday fail. In our case we don’t have our own building and have to go somewhere offsite on Friday night to get everyone in. The Tenebrae service modifications are really fantastic though. About 3000 young adults have been to one of the services over the last 4 years. I can send you a link to the files…including the chants composed for it. It is in Keynote so you would have to be a Mac user to open it. Otherwise I can send you a pdf. Tell me what form and I will send it to your diocesan email address. 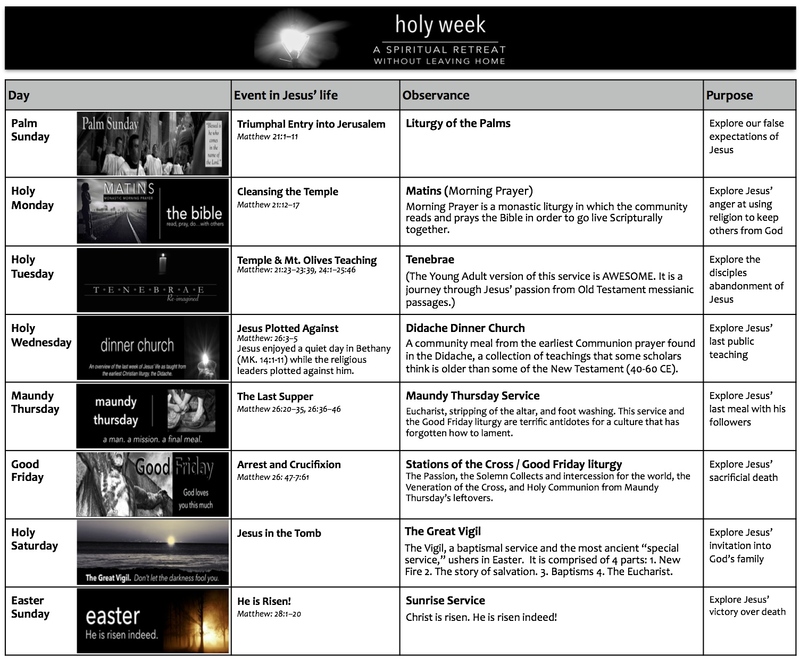 Thanks for the great posts on Holy week! Thank you. I have it up on a web page to listen to.